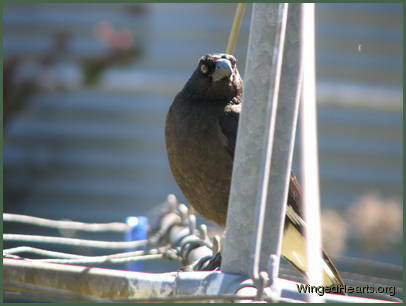 Here is Curly, the one-eyed currawong. 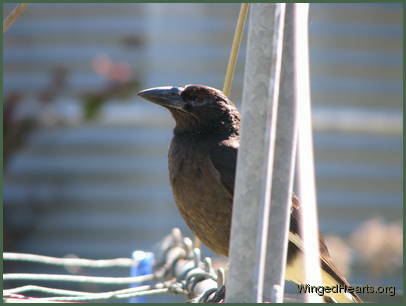 Curly and the winter currawong mob (maybe a hundred birds) left for greener pastures about four weeks ago, but I've been looking for curly in case he decided to stay for the summer. 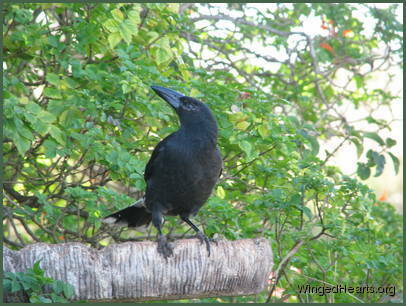 I don't understand the currawong 'system'. There are curries around all year, but they aren't the same ones in summer as in winter. 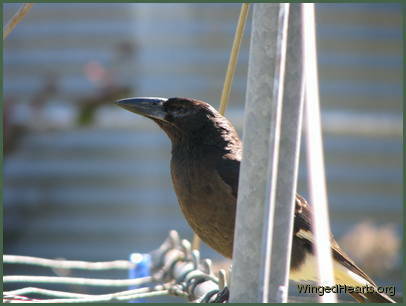 In summertime, we have maybe a dozen around the traps here and there, and we see just a few coming for a feed at any one time. 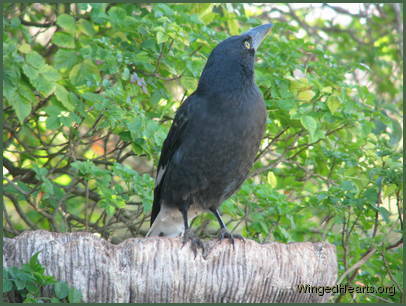 But during winter, huge numbers of curries feed and breed, and sometimes annoy the other birds by crowding around the waterbowls. Unfortunately the curries are less, shall we say, finicky, about keeping the water clean. 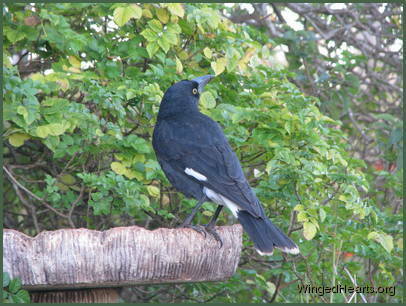 That annoys the magpies, who keep on asking for the water to be changed. 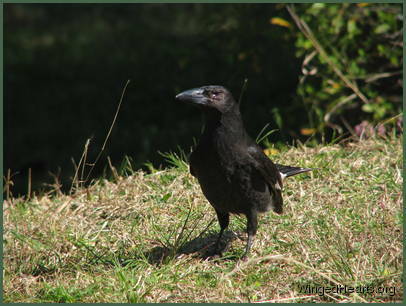 But anyway, the curry system seems notably different from that of typical migratory birds, who seem to all go in a crowd from winter to summer places. If the curries need to migrate, then why do they leave a big group in the winter area during summer? But that's what they do. 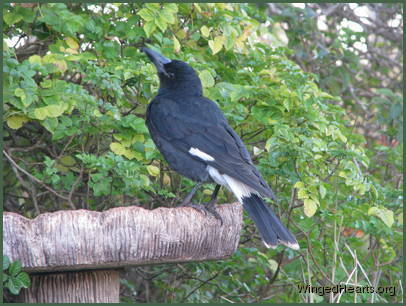 Now two years ago, Vicky magpie was followed around by a baby currawong, and she did help feed it at times. 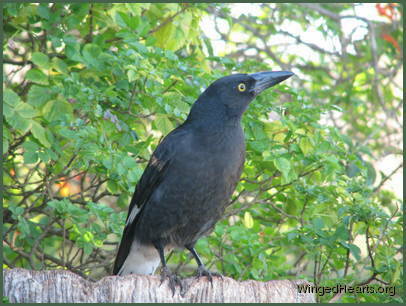 Now this year, for some months now, her family has been joined by an adult currawong that feeds with them. Is it the baby she nursed two years ago? Curries are hard to tell apart, so we'll probably never know. 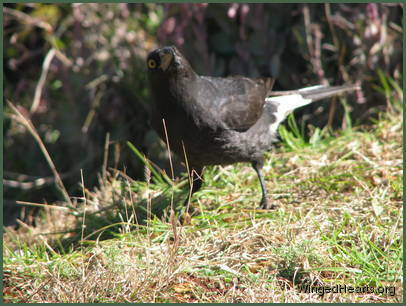 But here's a slideshow of Curly the one-eyed currawong. He's off with the main gang somewhere, so if you see him, he answers to his name and he likes a ball of grated cheese and crumbled bread. Say hello and please let us know where he is now! Permalink Submitted by Ron on 1 November, 2009 - 11:15. Yesterday morning, after maybe six weeks absence, Curly suddenly was amongst those present again. 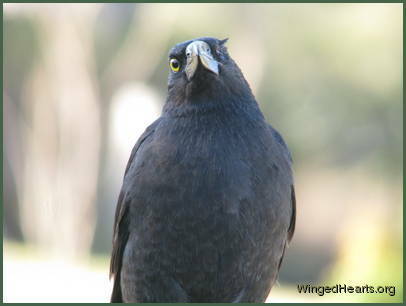 The currawong system sure is complicated. 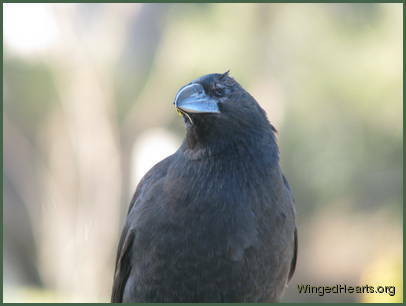 Where did the many scores of currawongs go? Why has only Curly and at most a few others (though I can't say there are any others) returned? The huge winter numbers simply aren't here, so if Curly left with the gang, the main gang itself is still gone. Is it just that Curly has only one eye and finds it easier being where he knows he can get a feed now and then? Very puzzling. Permalink Submitted by Anonymous (not verified) on 20 August, 2011 - 10:17. 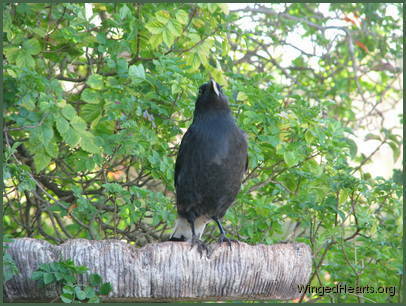 I'm not sure where you live, but we also have a one eyed Currawong that likes to come visit. 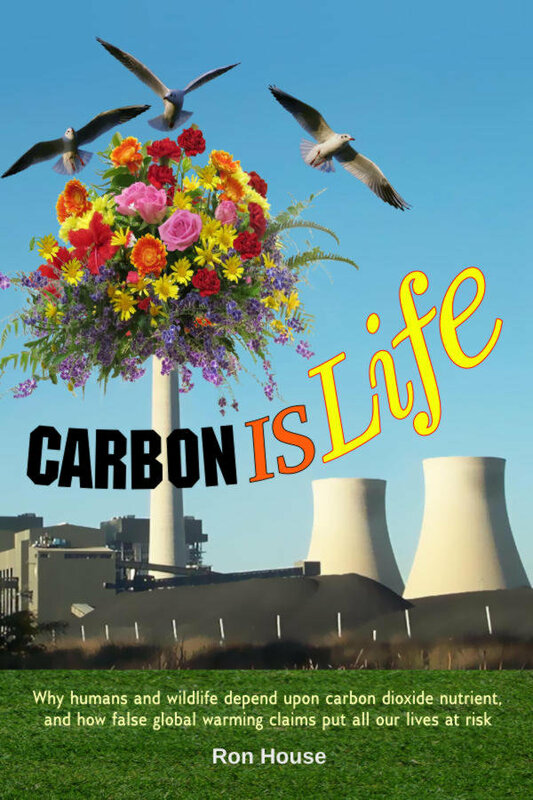 we live in Bowral NSW. 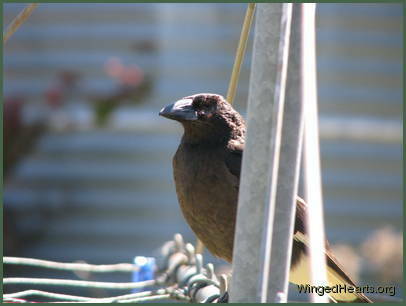 Maybe it's Curly, his missing eye is on the same side, however here he is appropriately named "Blindy". Permalink Submitted by Ron on 24 September, 2011 - 15:07. Hi, that could easily be Curly. 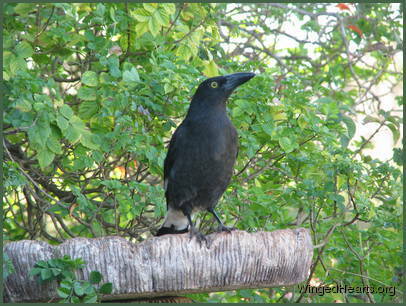 The currawongs travel a long distance during the year. Say hi to him from us!